Consider the sheer volume and impact of industrial processes in the Midwest and it becomes clear that opt-outs present a massive missed opportunity for industrial energy efficiency. More importantly, significant potential energy and financial savings for industrial utility customers will be lost. Thirty-eight percent of industrial sector electricity is consumed in Midwestern states, 34% of the electricity used in the Midwest is consumed by the industrial sector and 40% of the United States’ industrial energy efficiency potential is in the Midwest. Energy efficiency proponents need to work together to provide a suite of resources outlining the benefits of energy efficiency to industrial customers who might not realize the potential energy savings. Furthermore, we need to directly engage with those customers to make the case for industrial energy efficiency. 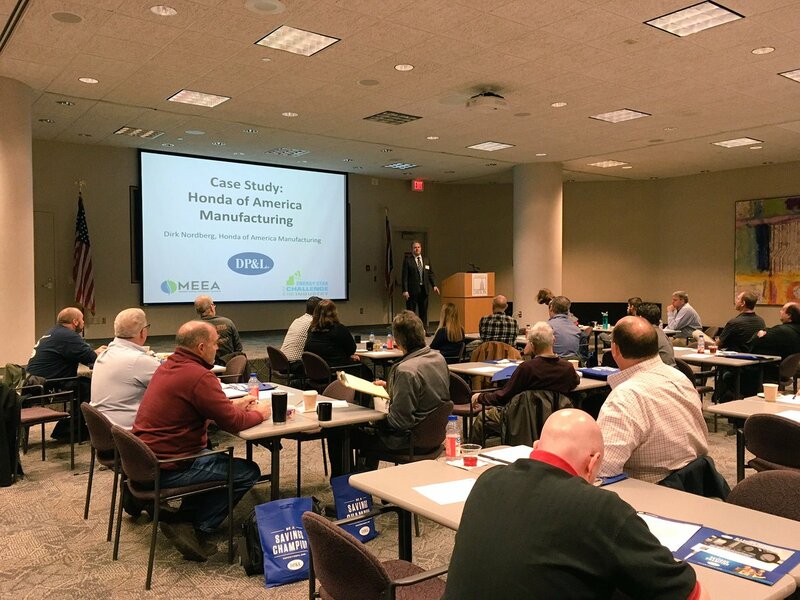 On November 16, 2017, MEEA held an Industrial Energy Savings Workshop for Ohio-based Dayton Power & Light (DP&L) customers, in conjunction with the Environmental Protection Agency (Region 5) and DP&L. 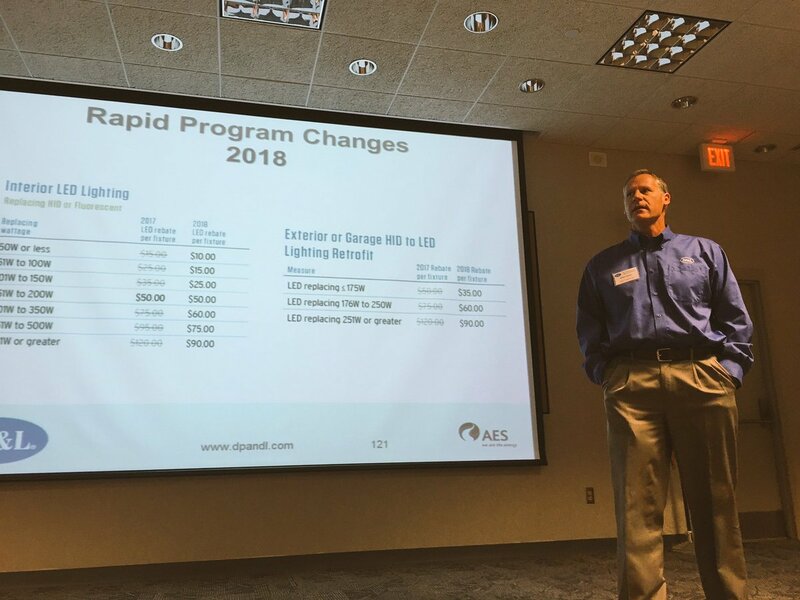 Approximately 30 medium-sized industrial utility customers attended and received an overview of 1) energy efficiency program opportunities, 2) available state, federal and regional resources and 3) ways to engage company staff to change the company culture to achieve continuous energy savings. Attending industrial company representatives, which included engineers, facilities managers and other facility staff, heard from various leaders and program designers about basic energy management planning, Dayton area manufacturing case studies and free resources. Go Sustainable experts Abdul Qayyum Mohammed and Greg Raffio explained basic internal strategies to accomplish energy management as well as analytical tools and the usefulness of third-party consultation once internal action is already underway. Dirk Nordberg of Honda and Paul Hartmeister of General Motors shared corporate visions, sustainability programs and individual plant energy efficiency project results. Dr. Kelly Kissock of the University of Dayton industrial Assessment Center (IAC) walked through the offerings of the IAC, including free audits and customized energy efficiency project plans with financing options. Melissa Hulting provided information on the ENERGY STAR Challenge for Industry recognition program, which requires a commitment of 10% energy savings over five years. MEEA provided information on Department of Energy’s suite of industrial resources and recognition programs, including the new 50001 Ready program and Better Plants, which requires a commitment of 25% energy savings over 10 years. 50001 Ready is a self-guided approach for facilities to establish an energy management system and self-attest to the structure of ISO 50001, a voluntary global standard for energy management systems in industrial, commercial, and institutional facilities. Through industrial customer engagement, we can connect customers with a multitude of existing resources and opportunities designed to help them change the culture within their own facilities. Events like this one in Dayton encourage incremental progress (despite weakened statewide policies) and equip the customer with opportunities to drive their own energy saving solutions. This particular event was also an excellent networking and utility consultation forum, bolstered by an event-specific rebate enhancement offering for attendees. If you are a utility or advocate interested in customer engagement strategies such as this one, please contact Policy Manager Nick Dreher at ndreher@mwalliance.org. Workshop photos courtesy of Mark Milby.